A very good place to start. Or not. For me a new piece starts with a lot of thinking. 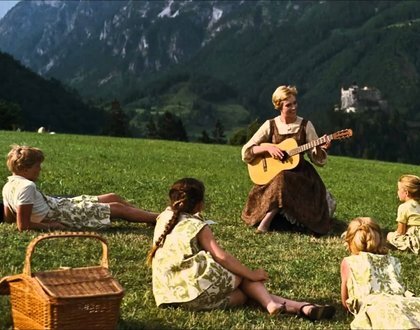 Long before the first notes are written on the page, I’ve decided on the inspiration for the piece, the title, the general shape, and much of the basic concepts and materials. I’ve heard in my head how the piece starts, how it ends, and I’ve got a bunch of ideas for highlight moments along the piece’s trajectory. Here’s the thing: the first notes that I write are the actual first notes. When I start writing, I start at the beginning. These are the notes that set the whole piece in motion. Everything that follows, follows from those notes. And those are the first notes the audience hears, the notes that invite them into the world of the piece. So it’s important to get those right. One of the big challenges I faced in writing the music for Book of Love is that I couldn’t start at the beginning. The music and dance were being shaped in tandem. When I started composing, I had seen a lot of movement and choreographed sections, but I didn’t know what the very first dance steps would be. I didn’t know what kind of character the opening music needed to have. Kokoro choreographers Jay and Barbara encouraged me to watch the movement and “just write”. Which brings me to another challenge: while developing material, the dancers need to work with music, but of course I hadn’t written any. So they created their material while dancing to other music. Pop songs, world music, blues, whatever. While I watched them dance, I was hearing other music. As someone whose ear and brain and memory are so attuned to music, it was very challenging to see the dance over and over again and not connect the movement to those songs. Even watching the video of the dancing with the sound off, I could still hear that music — I could turn off the sound, but I couldn’t turn off my memory! But I had to dive in and start something, so I took one of my ideas — a long sustained pitch, filled with subtle internal motion and shifting colours, that slowly unfolds upwards to a peak, then descends into a dark marimba solo — and I wrote. I didn’t know exactly which dance movements would go with this music. I didn’t know where it would be in the piece. It felt like jumping without a parachute, but from watching Barbara, Jay, Molly and Billy dance, this is the first music that I heard. 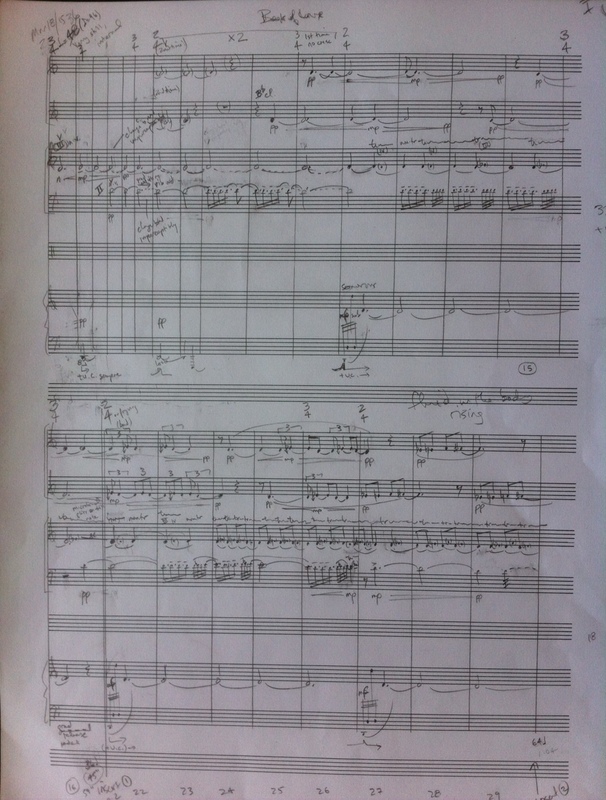 And this is the first page of pencil score that I wrote. Notice how I optimistically titled it “Book of Love” as though it were the start of the whole hour! 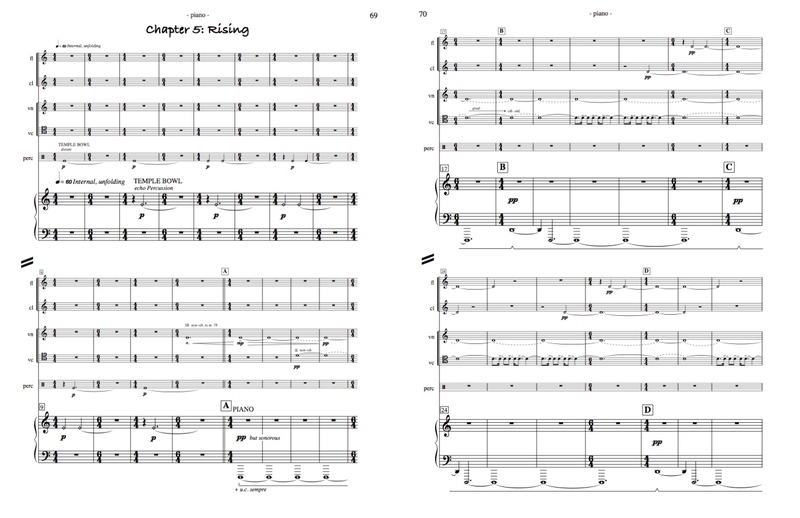 In fact, in the finished score, this begins on page 69 and this music ended up being the fifth and sixth movements in the piece — the middle, nowhere near the beginning. And from first draft to finished score, it also evolved quite a bit — also not typical for me, as by the time the pencil hits the paper the music tends to emerge fairly fully formed. But the process of putting this with movement required music that started with a certain malleability. One thing you can see is that the first measure I wrote is actually m. 12 — because this ended up not being the first movement, I needed a transition passage from the previous movement (which is quite a bit faster) and I wanted to bring back the temple bowls that, as it happens, actually open the real first movement. (Are you still with me?) Also, I found I needed to add repetitions of phrases, drawing out the evolution of the sound and colour. And significantly slow down the tempo. But more on that in the next post. Stay tuned!